Photo credit: By Porto Bay Hotels & Resorts under Creative Commons Attribution-Share Alike 3.0 Unported License. It's a day before 2013 ends and 2014 is ushered in. 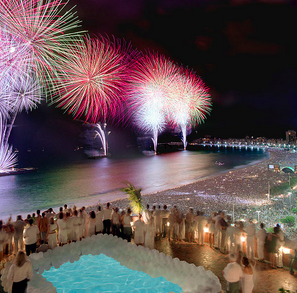 The first countries welcoming the New Year 2014 are Samoa and Kiribati. On a global scale, parties, fireworks, plenty of food, offerings and other traditional observances will welcome the New Year. In whatever manner a community celebrates the coming of the New Year, what is certain is that people want to leave the past behind and welcome the coming year full of new hope and gratefulness. Let us take a look around the globe and learn about some New Year traditions. The tradition of dropping a lighted ball from the top of the One Times Square building started in 1907, a tradition started by the owner of The New York Times, Adolph Ochs. The original ball was made from iron and wood and lit by 100 incandescent bulbs and while the original design is maintained, it is now made with triangular crystal panels and computerized LED lighting system. It has inspired similar ball (or object) drops in many parts of the United States. At the stroke of midnight on New Year's Eve, Spaniards each one grape for each minute, while saying a wish. They will continue to eat a grape until the 12th minute, in the belief that the ritual would bring them luck for the coming 12 months. The Greeks believe they will be lucky for the whole year when they get the gold coin in the New Year cake. January 1 is the day that St. Basil delivers gifts in Greece. It is also the saint's feast day. The first day of the year is considered lucky in Greece and is the time to buy lottery tickets, roll the dice and play card games. In many parts of China, every window and door in the house is opened so that the old year could leave and the New Year can come in. The Chinese also believe that brushes and brooms, even vacuum cleaners should be kept hidden to avoid sweeping good fortune away. They also believe that eating a cooked chicken with its heat and feet still attached assures them of good fortune for the whole year. The Danes welcome the New Year differently. They hurl old dinnerware and glassware at the doors of their friends and relatives for good luck. Some stand on chairs as a group and jump together at the stroke of midnight to "leap into the New Year," which is meant to banish the bad spirits still lingering around and bring in good luck. This could be a scary sight, because in Johannesburg, it is a tradition to throw old appliances out the window on New Year's Eve. The celebration of New Year's Eve in the Philippines is a mix of different cultures. The three dominant ones are Spanish-, American- and Chinese-inspired. There are still plenty of Filipinos that wear clothes with polka dots, which represents money. Families usually have a midnight feast after attending mass, display 12 to 13 pieces of different round fruits, eat 12 grapes, hang a bunch of grapes on their door frame, light firecrackers and fireworks, keep money in their person and wallets and jiggle coins in their pockets. Noodles and sticky rice cakes are normally part of their holiday spread. Let us bid the old year adieu and welcome the New Year with a cheerful Happy New Year, Bonne année, Xin nian yu kuai, Feliz año Nuevo, Manigong Bagong Taon or Felice Anno Nuovo!